Today Usain Bolt ran his last individual race. The end of an era. His career was nothing shy of pure dominance. This got me thinking, who are the most dominant athletes I’ve ever had the privilege of watching? Dominance can mean anything. In Usain Bolt’s case, which I’ll get to later, it was effortless defeat of the fastest humans on the planet. But dominance isn’t just based on winning. A dominant athlete is one who leaves no shadow of a doubt that they will destroy their competitors. They are the ones that make their opponents shake in their boots. The ones where, when they’re competing, everyone else is competing for second place. Without further ado, the 5 most dominant athletes I’ve ever watched. In the 2000s, no one was better than Tiger. No one. He has 14 Major Championship wins (4 Masters, 3 US Opens, 3 Open Championships, and 4 PGA Championships), good enough for second most all time. From 1999 to 2010, there were only 32 total weeks where Tiger wasn’t the number 1 ranked golfer in the world. So, out of 577 weeks, Tiger was #1 for 545 of them. But it’s more than just the numbers for Eldrick. The Nike gear. The Sunday red. When he stepped onto the course, all eyes were on him. He was the favorite and a win was expected. He wasn’t cocky, but he was confident. He dominated golf for well over 10 years. As far as I’m concerned, these two are fish. They have gills and webbed hands/feet. I’m grouping them together not to take anything away from either of them, but because I couldn’t have one on the list and leave the other off. They win every race they’re a part of. They’re equally as dominant in the pool. What other swimmer do you see racing a shark? Michael Phelps is the most decorated Olympian of all time, with 28 medals. Of those 28, 13 are individual gold medals. Phelps won his first medal in the 2004 Olympics and he’s never looked back. I’ve never considered that Phelps could lose a race, and that’s because he almost never does. Jesus could walk on water, but could he beat Phelps in a race? It’s impossible to say. Katie Ledecky has been every bit as dominant as Phelps has. She is not as decorated as Phelps, but she’s also much younger. In her first Olympic appearance in 2012, she won gold in the 800m as a 15 year old. 15! At 15 I was struggling to curl 15lb dumbbells to try to get girls. Ledecky has the chance to surpass Phelps’ numbers. She’s got the talent and it wouldn’t surprise me. EDIT: Bolt just came in 3rd in his final individual race. Below is what I wrote originally, and I still believe every word I wrote. Ask anyone in the world. Anyone with a brain. Who’s the fastest man on Earth? There’s only one answer, and that’s Usain Bolt. He has NEVER lost a race** and currently holds the world records for the 100m dash (9.58 seconds) and 200m dash (19.19 seconds). He is the 3-time defending champion in the Olympic 100m, 200m, and 4x100m relay. Usain Bolt not only beats his competition, he destroys them. When he races, he coasts to victory and leaves his opponents in the dust. Imagine being the fastest person in your country, running as fast as you possibly can, and the man in the lane next to you is cruising at 80% speed, still gaining ground on you? That’s how it feels to race Usain Bolt. He’s the greatest sprinter of all time, the fastest man in the world, and the subject of one of the great spoof videos ever. **He was DQ’d once for a false start, and a member of his relay was once DQ’d for PEDs. He has never lost a race he started. Joey Chestnut? Is that guy even an athlete? Let me answer that for you. Yes. And he is one of the most dominant athletes ever. As a huge fan of the Nathan’s Hot Dog Eating Contest, I have watched Joey Chestnut rise to fame. I remember the days of Takeru Kobayashi, and I remember being shocked when he was taken down by the then mystery man. Chestnut knocked Kobayashi off of his throne in 2007 and has not given it up since. Since defeating Kobayashi, Chestnut has won 10 of the last 11 Nathan’s competitions, with his only loss coming in 2015 to Matt Stonie. Is competitive eating ridiculous? Of course it is. But let’s look at the numbers. In 2017, Joey Chestnut set an all-time record by eating 72 hot dogs in 10 minutes. That is, how do I say this, disgusting. Over 7 hot dogs a minute for 10 minutes straight? I couldn’t even fathom that. I can barely stomach 2 hot dogs in a sitting. What makes it even more impressive, is that he has improved over the years. The Tom Brady of competitive eating. The GOAT. Let me address the obvious. Yes, Barry Bonds did steroids. I know it, you know it, everyone knows it. But in the era I grew up watching baseball, there was no more dominant force in professional sports than Bonds. End of discussion. Let me throw some statistics at you. No, not his all-time leading 762 home runs or 2,558 walks. Not his lifetime 1.051 OPS. Nope, let’s look at some stats that make you realize just how unstoppable this guy was. Bonds was intentionally walked 688 times, 385 more than the next person on the list (Hank Aaron, 293). That’s how feared he was. Bonds struck out over 100 times only once in his career, his rookie season (102 in 1986). If that’s not enough, Google some Barry Bonds fun facts. You’ll be entertained for hours. 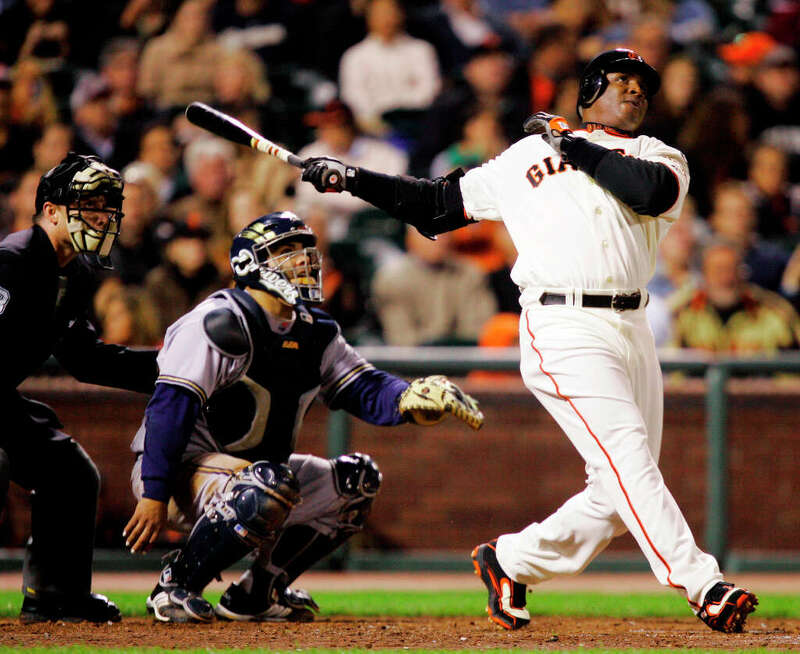 When I saw Barry Bonds hit, I always felt like he was going to hit a home run. Always. That’s how intimidating he was. If stats aren’t enough, ask a person who watched him. His presence was enough to make pitchers want to leave the mound. He was intentionally walked with the bases loaded for Pete’s sake! He was the most dominant athlete I have ever watched.